Coffee time will be much better all thanks to this Wonder Woman Character Travel Mug. This is a double walled stainless steel travel mug with on it a cool print of Wonder Woman and there are more images of her like they are stuck on top of each other. And this Wonder Woman mug comes in 20 and 30 oz and even as a water bottle version. Now you can bring your favorite beverage with you where ever you go and the mug is great at keeping your drinks warm or cold. So if you like coffee for on the go then you can us this mug and even bring it to your favorite coffee shop so that you don’t need a paper cup. 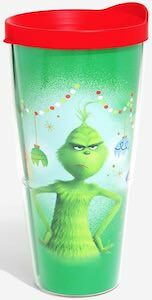 Now you can have a festive The Grinch Travel Mug. We do know that the Grinch has different feeling about the holidays and as you can see on the green mug is the Grinch and he does not look very joyful and he is surrounded by some broken ornaments. On the back of the mug it says “This Is Me Being Jolly” in a fun font. The travel mug is BPA free and can hold up to 22oz. and is not dishwasher or microwave safe. The mug itself is mainly green and the top is red which makes it looks festive and ready for your holiday shopping. If you like to make shakes and superhero’s then check out this Deadpool shaker bottle. The shaker bottle has a black color but is translucent with the Deadpool logo on it and the top is red and to make this an amazing shaker they added a spring center so that things like your protein powder mixes better with your water or juice. And the Marvel shaker bottle is dishwasher safe so super easy to clean when you get back from your workout and making it easy to get ready for your next shake. An officially licensed Deadpool bottle like this is great to own. 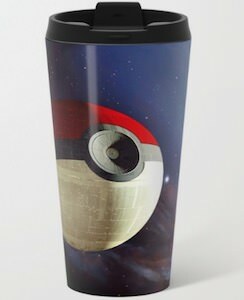 If you are a fan of Pokemon and Star Wars then you should check out this Poke Ball Death Star travel mug. The travel mug shows a galaxy and in that galaxy you can see a spaceship that is almost as big as a planet and it looks a lot like a Poke Ball but it also looks like the Star Wars Death Star and that is why this is a great to go mug for fans of Pokemon and Star Wars. The Poke Ball mug is 15oz and is made from stainless steel and is double walled to keep warm drinks warm and cold drinks cold. So no more need to get a paper cup because this travel mug is all you will ever need. If you like The Office and love coffee then you need this cast of The Office mug. 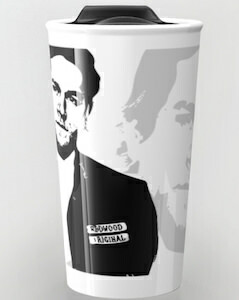 The ceramic mug comes in two sizes and you can get this mug as a travel mug version too. On the mug you can find many colorful squares and in each squares you can see black and white drawings of a cast member for the super funny show. 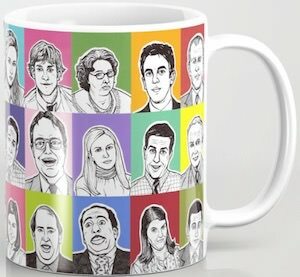 Micheal, Jim, Dwight, Pan, Stanley and all the others are all there and most of them you can find more then once so that you can look at this mug from any angel and see your favorite from The Office. Now you’re morning coffee will make you smile a little bit more all thanks to this amazing mug. 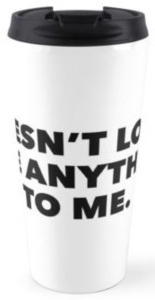 If you can get pretty mad without coffee then you need this Taz travel mug. 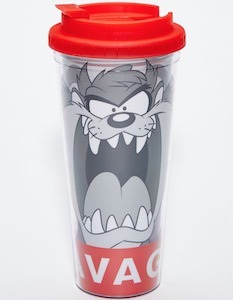 The travel mug is 24 oz in capacity and is see through and has a red lid and on the mug itself you can see the Tasmanian Devil from Looney Tunes and he looks pretty annoyed and on the lower part is says in a red banner it says “Savage”. So now you can fill your mug at home in the morning and then when you get to work and you mug is empty you will not look like the Tasmanian Devil any more. It will also be perfect for taking to your favorite coffee place as they will know that that you can be not very friendly without your coffee. 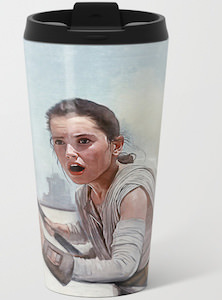 If you need coffee in the morning and you like Star Wars then check out this amazing looking Rey travel mug. The Star Wars travel mug is made to be your go to mug for on the go and for at home. 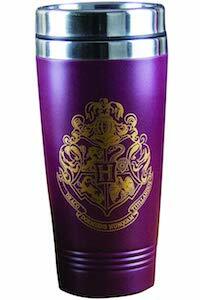 The mug is double walled and stainless steel so that your hot drinks will stay hot and cold drinks will stay cold. And this 15oz mug has a twist-off snap lid that is leak proof making this mug just perfect for on the go. Now you can bring your coffee from home or just use it when you stop for coffee instead of the paper cups. On the Star Wars mug, you find Rey and she is in the middle of something as she looks really focused.